Both make fantastic gluten-free matzah balls throughout the year. Even though Paskesz’s gluten-free “Matzo Ball Mix” sounds like it would be better, it isn’t; the tapioca starch makes the matzah balls gummy, so stick with the Pesach Crumbs or Knaidel Mix. Update: I’ve decided that Lieber’s Knaidel Mix makes the best gluten-free matzo balls, light and airy. — Kugel noodles. It is hard to find gluten-free kugel noodles during the year, so I buy a few bags during Passover. I bought Manischewitz “Passover Gold Yolk-Free Medium Egg Noodles” and Paskesz “Premium Egg Noodles,” which I have not tried before. Update: Skip the Passover egg noodles; they are mushy and gummy. — Streit’s “Chow Mein Noodles.” I haven’t tried these before, but I can’t wait to serve them with Chinese food. — Gefilte fish. Most brands contain matzah meal, but Kedem “Gourmet Gefilte Fish” does not and is therefore gluten-free. — Lieber’s “Mini Mandlin.” Mandlen are essentially soup croutons that my kids love sprinkling in their chicken soup. — Manischewitz potato starch. Unlike floppy bags, these canisters of potato starch are easy to store for baking year-round. — Bakery cookies. Shabtai Gourmet, Oberlander’s and Schick’s all offer boxes of gluten-free bakery-style cookies. A big plus for my daughter is that they look “fancy” (her favorite word). Keep a spare box of rainbow cookies, black-and-white cookies or lace cookies in your freezer. Remember to read the labels to make sure they’re gluten-free. — Macaroons. Most of these moist coconut cookies are gluten-free, but some contain matzah meal, so make sure to read the label. — Osem pound cake. These pound cakes, marble cakes and chocolate cakes are small and easy to keep in the freezer. — Boxes of chocolate candy. Most Passover candies are gluten-free, but check the ingredients to make sure that no matzah meal is included. I can’t resist buying caramel cashew clusters. — Gedilla ice cream cones. I haven’t tried these yet, but I couldn’t pass up gluten-free ice cream cones. — Gluten-free matzah. The kosher grocery store did not have gluten-free matzah in stock when I went. Gluten-free matzah is crazy expensive and tastes like cardboard, but I feel it’s important for my daughter to have her own matzah. 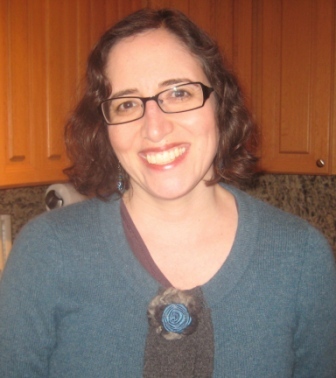 Two options are Gluten-Free Oat Matzos and Lakewood Matzoh. Important update 3/16/10: The 16-ounce Gluten-Free Oat Matzos are NOT labeled gluten-free this year and are instead simply called “Kestenbaum’s Oat Matzos.” Apparently, they tested at 80 ppm (parts per million) of gluten. For reference, the U.S. has not passed a labeling law for gluten, but a threshold of 20 ppm has been proposed. Update 2012: I love the new Yehuda Gluten-Free Matzo-Style Squares. They taste like a thin, crisp lavash cracker, so good that I bought extra boxes to enjoy year-round. A note printed on the box this year says that the matzo is “not for sacramental purposes,” because it does not contain oats. (Technically, hamotzi needs to be said over matzo that has wheat, spelt, rye, barley or oats.) My family uses this as matzo for the seder, though. The online prices seem high; look locally instead. I bought the Yehuda Gluten-Free Matzo-Style Squares for $6.99/box at a local Jewel supermarket that has a large kosher section. The Yehuda Gluten-Free Matzo-Style Squares are much tastier, and much cheaper, than the gluten-free oat matzos. — Chicken nuggets. It is hard to find kosher gluten-free chicken nuggets during the year, but there are a few options on Passover. My kids like Spring Valley “Breaded Chicken Pattie Nuggets,” which are breaded with potato starch. Meal Mart has chicken and turkey nuggets that are gluten-free, but my kids don’t like the turkey taste. This year, I bought Meal Mart “Fun Shapes Breaded Chicken Breast Nuggets.” The package was not labeled gluten-free or non-gebrokts, so I called the company to confirm the gluten-free status. Make sure you buy a Passover package, as the year-round nuggets are not gluten-free. — Dr Praeger’s “Potato Crusted Fish Sticks” and “Potato Crusted Fishies.” An easy dinner for when there’s a babysitter! — Blintzes. During the year, blintzes are made with wheat. On Passover, some brands are made with matzah meal and some are gluten-free. Some gluten-free options are Frankel’s and Spring Valley blintzes. — Frankel’s “Matzo-Free Balls.” These premade frozen gluten-free matzah balls are convenient to take to my mother-in-law’s house and drop in her chicken soup. — Country Pie & Pastry hot dog buns and hamburger buns. It’s hard to find pareve (non-dairy) gluten-free hot dog buns during the year. Not only do these fit the bill, but they are surprisingly airy. I understand gebrokts to refer to matzah that has been exposed to water, and therefore non-gebrokts on a food item ensures that there is no matzah meal in it (to get wet). What does it mean when a wine is labelled “non-gebrokts”? You’re right. “Gebrokts” literally means “broken,” and it has come to mean wet matzah, because matzah is usually broken up into crumbs before it is mixed with water. Passover food labeled “non-gebrokts” means that it does not contain matzah meal and is therefore gluten-free. I have not heard about wine being labeled non-gebrokts. Some wine is labeled “mevushal,” meaning that it has been heated for traditional reasons that trace back to making sure the wine wasn’t used for idolatrous purposes. I was just doing some research online when I found this… 3 weeks ago I was diagnosed with celiac disease and one of the first things that came across my mind was passover and how I wanted to still be able to keep the holiday. Passover is always a holiday I do my best to with hold the tradition of even with my birthday being April 9th my sister and parents will buy the pasadic cake mixes and bake my a birthday cake. One thing my family was going to try and do is to make gluten-free matzah at home, I was wondering if you have ever tried to do such a thing. We have also considered following sephardic beliefsm instead of ashkenazic beliefs, which would allow us to eat corn and beans during the holiday opening up my “pasadic” dietary options. Any sort of response to this would be appreciated. The first six months of going gluten-free are the hardest. So hang in there. After a while, you will know which food to buy and it will all be much easier. I have never tried to make my own matza. I love the Yehuda gluten-free matzo-style squares, glutenfreematzo.com. They taste like crackers, and I buy extra boxes and eat them all year round. If you go to a kosher grocery store and spend some time looking at all the ingredients, you will find plenty of Passover food that is “non-gebrokts,” meaning that it does not contain matza meal and therefore is gluten-free. I will take my pre-Passover shopping trip soon and will post an updated list of products. I think the best approach to being gluten-free on Passover or any time of the year is to focus on whole foods, not processed foods. (Mind you, we do eat plenty of processed snack foods in my house.) 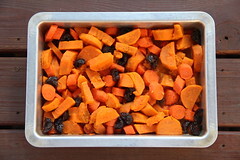 If you plan your Passover meals around roast chicken, brisket, chicken soup, fish, eggs, sliced turkey, tuna, veggies, potatoes and quinoa, you’ll be able to make it through, even if you get bored of those foods in eight days. 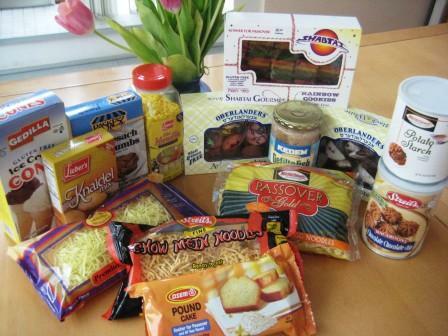 The are plenty of packaged Passover foods too; some tastes good, others aren’t great. It helps a lot to have a supportive family who understands the importance of being strictly gluten-free. And it helps if meals can focus on whole foods and fewer starches. It’s hard when there are traditional foods in our families and we want to eat the same food we’ve always eaten for the holiday. Being diagnosed with celiac certainly is a bit of a loss — you are losing foods you are used to and adjusting to a different lifesytle. But it is a great, great gain in terms of health. You will see the time spent with family and friends is the best part of the holidays, even if the food is different. And with a few months of time, you will find a wide variety of food that you and your family can enjoy. Feel free to check in with me later and let me know how it’s going, or if you have more questions. I am just finding your blog- LUCKY me. Just in time to make Hamantaschen! My eldest daughter was diagnosed with celiac disease a year ago. Our first passover was a blur to me. I thought passover would be an inherently easy holiday BUT i found that most of the kosher companies dont comment on their labels about cross contamination or use of shared equipment. How do you approach this problem? I recently tried your 48-count box of ice cream cones, and they are fabulous! When I returned to my local ShopRite supermarket, they told me that they are “out-of-stock” on them, as they only carry this item for the holiday season. I really want to buy more NOW! Can you tell me where else I can purchase these wonderful cones? Much obliged. I have to warn you that the Passover egg noodles are really not that great. They fall apart in a second and turn to a potato-starchy mush when you cook them. You still may want to buy a bag around March or April and try them, but you might be disappointed. Schar’s tagliatelle noodles don’t have egg in them, but they are a little more similar to gluten egg noodles. They are not kosher for Passover, though. I just tryed the best Gluten Free Matzo Ball mix at eenaKadeena.com !! It was extremely easy to make and they came out Great!. I am about to order more for Passover. The box I have says that it is Kosher. I’ll second this one – I’ve had the Eena Keedena Gluten Free “Mockzah Balls” and they are truly amazing in taste, totally what Bubbie used to make. The Kestenbaum Oat Matzo last year said in big letters “Gluten-Free Oat Matzos” (like the logo on their web site). This year, the box I saw in the kosher grocery store said simply “Kestenbaum Oat Matzos” without any mention of being gluten-free. My daughter ate some of them and seemed fine. Though she said that last night she felt like someone was inside of her tummy punching her (she’s 5). But she didn’t have any matza yesterday, so who knows what it was from. Tonight we served some Meal Mart kosher for passover chicken nuggets. They did not say gluten-free on them, but they did not contain any gluten ingredients. I had called the company when I was buying them at the grocery store to check (gotta love cell phones) and the man said they were gluten-free. I’m hoping nothing’s punching the inside of my daughter’s tummy tonight! Now, I can’t help but wonder if both my sisterinlaw and I purchased last years batch, as the box clearly states “gluten free”? the interesting bit about the packaging was the inner wrapping..Her’s was blue tissue paper and mine pink. No matter what, I can only say that I will not be eating any matzah for the rest of my life!! I sent a scathing email, but no reply! What a waste of hard earned money! I still must call Meal-Mart about the deli slices. Thanks for your reply! Enjoy the rest of the holiday without any “punches from inside the tummy!” The sun is finally shining and my daffodils are in bloom! I don’t live too far from the Streit’s factory so I will check out what else they’ve got. I’ve been looking for Chow Mein Noodles for a long time! Before CD, when I was little, my grandmother and I used to buy their matzoh right out of the oven. Sigh. So many wonderful sounding things available in some parts of the country….unfortunately, not here in Buffalo. Look for Passover rolls and pastries by Eytan, a bakery in Israel that delivers gourmet frozen products to the U.S., you won’t believe it’s kosher for Passover AND all of their products are gluten free. Thanks for your note. I’ve seen those hot dog rolls and hamburger buns, but I listed them under the name “Country Pie and Pastry,” because that name is also on the label. I’ve seen some buns from them that say “Eytan” and some that say “Aviv,” and I’m not sure what the difference is or what the proper name of the company is! Regardless, the rolls are light, airy and taste great! Does anyone know where I can order/buy Eytan’s Kosher for Passover Cinnamon Rolls? I can’t find their website. Thanks. I hope that helps you track them down. Thank you. I took your suggestions and went to the Kosher Experience in Cherry Hill, and did my shopping. Do you have a recipe for the pesach crumbs to make matzah balls? I will put one up later this week! You are not just a pretty face. You really do your homework. You must have put a lot of research in preparing for the Pesach blog. Thanks for all the wonderful ideas. Thanks so much for your great info. 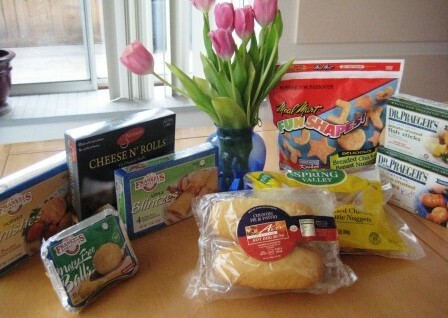 I just got back from my gluten free Passover shopping and wish I had your list before I went. I think I need to go back. I also bought Meal Mart Potato and Pastrami Knishes that were good and and and a nice treat! Thanks again! Those knishes sound good. I will look for them. Thanks for your comment! You’re right, quinoa is kosher for Passover and a great addition for the holiday. I meant to pick a box up when I did my Passover shopping, but I forgot! Well, I know I will need to make another run anyway. How old is your son? I hope to add a “going gluten-free starter guide” to the blog at some point. In the meantime, if you have any questions, feel free to post them here.